A research paper on Everyday Use by Alice Walker depicts the delicate African-American experience encountered moving out of the era of slavery and oppression. Which daughter do you think Alice Walker would be most like? Who do you think best represents African Americans today, Dee or Maggie? Dee, being a young woman just into the college scene, reflects Walker's idea of the eager, young black woman clutching on to her heritage through symbols of the past; namely through 2 quilts that were made by her grandmother. She wishes to hang them on the wall as an icon of days gone by. Walker's personal beliefs reflect that of Dee's mother. The quilt would serve better if it remained in "everyday use" by Dee's younger sister Maggie. While Dee longs to have a piece of her heritage, Walker makes the point that people are the real heritage and their memory should serve as the focal point of their culture. In Alice Walker’s Everyday Use, contradicting perspectives of its female characters reveal the disparity in demonstrating the value of one’s heritage and culture. Maggie and her mother, the narrator, signify a vastly different existence from Dee, who represents materialism and vanity in regard for the past; determining the value of heirlooms based on “style” and aesthetics. Maggie and her mother, on the other hand, prefer a more simple life that values culture and heritage for both its personal meaning and practicality. The clash between these women and their connection to the past culminate into a battle over the story’s most significant symbol; hand sewn quilts. Using the symbolism of the quilts, Alice Walker shows the reader her position on the debate; arguing that heritage and culture should be valued, not as a distant heirloom, but in everyday use. Slavery in America - Slavery in America research papers discuss the history of slavery in America and show that race was a major issue in slavery. Order a research paper on Slavery from Paper Masters. Materialism in America Research Papers deal with how Americans are too materialistic. The Color Purple - Alice Walker wrote The Color Purple in order to capture and illuminate the hardship and bitterness African American women had to face in the early 1900s. Value of Literature - Paper Masters - the value of literature and a college education through term paper writing. Afro-American Studies - African American Experience Research Paper studies female authors such as Toni Morrison, Alice Walker, and Zora Neal Hurston. Toni Morrison - African American Experience Research Paper studies female authors such as Toni Morrison, Alice Walker, and Zora Neal Hurston. Sula Toni Morrison - African American Experience Research Paper studies female authors such as Toni Morrison, Alice Walker, and Zora Neal Hurston. Sula - African American Experience Research Paper studies female authors such as Toni Morrison, Alice Walker, and Zora Neal Hurston. 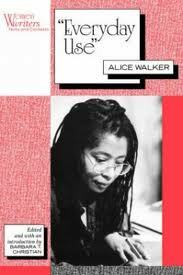 Paper Masters writes custom research papers on Everyday Use by Alice Walker, a book that depicts the delicate African-American experience encountered moving out of the era of slavery and oppression, and into a new era of choices and evaluation of what their history means to them.